This 10-1/2?. 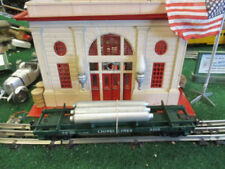 This train car is perfect for any O gauge or military collector! Beautifully hand-painted flatcar deck that simulates woodgrain. Includes an ammo box on the flatcar. Each flatcar is uniquely numbered - No two are alike! This one dates from 1956-up. The plastic parts are flawless. The lettering is clear and bold. The wiring is in good condition. Tested and working. Nothing is broken or missing and there are no reproduction parts. NAVAL SUPPORT FLAT CAR w/ PROPELLER. #6-36016 ~ O SCALE. CONDITION: LIKE NEW W/ BOX. trucks and military vehicles. TTX 6-16975 WITH CONTAINERS. LIONEL DOUBLE STACK SET. Item # 6407. I do believe that this missile is a REPRODUCTION but still a very hard car to find with any missile. You be the judge of it. I am not 100% sure. FLAT CAR WITH STERLING MISSILE. Made only in 1963-most were destroyed as kids used the missile pencil box like a toy. The Auto-Loader is original Lionel but the 4 red cars with gray bumpers are recent reproductions. Cars of course are like new. 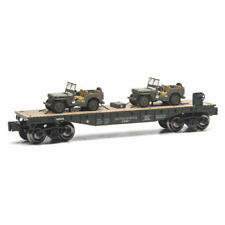 #6-16322 - TTUX Flat car with (2) Sealand trailers. Box grade: P-5 No window, box is torn at spots, box is dirty. Car grade: C-8 Like new, doesn't appear to have been used. Martin (209) 202-9355. THIS COLLECTION CONSISTS OF APPROX. This is for a Lionel Union Pacific bulkhead flat car with lumber load item# 16380. TWO Lionel UNMARKED gray and brown Flatcars. O / O27 Scale Marx & Lionel Train Accessories. Stamped Lionel on bottoms (see detail pic of this). The 2 CSX cars are MTH and fit snugly, the 3 lionel cars will fit but are not as snug. Make Supersized seem small. I am located in Seminole Florida near Tampa/St Petersburg. 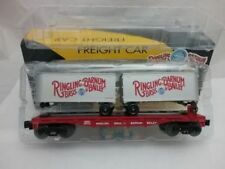 Lionel Freight Cars Pre-War #810 Derrick #811 Flat Car with Logs #817 Caboose. Condition is Used. Three freight cars well played with. Garage sale find . In same condition that I found them . Dirt and dust wiped off. The Derrick (crane) 1931(B) Large classic O gauge manually operated with 3 knobs on rear of cab. Flat car #811 1926 maroon with nickel journals and oil label. I believe the load may not be original. Caboose #817 1932 peacock body and dark green roof. All show played with wear to the finish. All will be sold as-is. ship to the lower 48 states only. Please look at the pictures and ask questions and more pictures before bidding. Thanks for looking. Manufactured 1959-60. Box is very nice. Car is fairly common enough. Good condition. See pictures. Item Condition: Excellent. The box does have storage wear. Like new Condition-(Not even sure if its been used ) in Original box. POSWAR LIONEL 6650 FLAT CAR WITH MISSILE LAUNCHER. All the missile launching components as well as the missile look fine. No issues here at all. Again a great looking piece that IMHO I would rate as in C-7, excellent plus condition but take a good look at the pictures and you be the judge. NIB 👍 F478. FLAT CAR WITH GRADER- NOT ORIGINAL LOAD. FLAT CAR WITH LOAD- ORIGINAL. 55 years of collecting model trains. Handling covers the cost of boxes, bubble wrap, labels, ink, paper, etc. FLAT CARS -NEW IN BOX. W/ GIRDER LOAD. DEPRESSED FLAT CAR. drilling holes and screwing them down. That may be common, I don't know, but he loved this hobby. used condition. My father-in-law liked to "mix and match" and attached vehicles to train cars by. LIONEL 6-16983. PENNSYLVANIA RR Well FLAT CAR w 2 CABLE REELS (13”length). One hand break wheel missing. 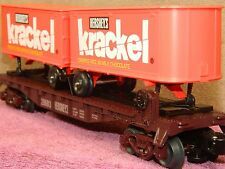 LIONEL O SCALE FLAT CAR, FORD WITH TRAILER, LIONEL #6-16916;. IS SHOT WHILE CAR IS IN BOX. Sold as is. Manual Condition=. Box/Case Condition=. These were produced by Lionel in 1958 - 1959. The flat car is version 6511-2, which is stamped on the bottom of the car. In addition, it is heat stamped with 6804 to the. Also it has the correct Pyro logo stamped on the bottom of the trucks. Up for consideration is an O scale Lionel undecorated cable cushion car. This item is in good condition. We strive for 5's. We take great pride in every item listed here at Classic Collectibles. Lionel No. 6827 Harnischfeger Power Shovel Car in LN condition, with OB for the car only. Shovel is complete with all components, but I will leave it to the new owner to finish assembly of the power shovel kit. This flatcar and trailer are in great shape, especially considering their age, and the fact that they have been played with. to buying. 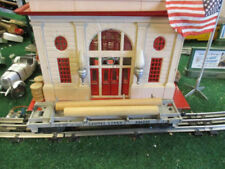 Lionel 831 Pre War Flatcar with Wood Load. Condition is Used. Shipped with USPS Priority Mail. Includes 2 Corgi Mack Trucks. Die-cast Trucks. 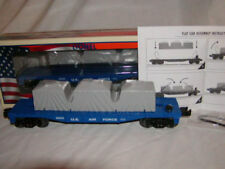 Lionel 6-36900 Depressed Center Flatcar w/ Backshop, New: still in clearwrap. LIONEL POSTWAR 6162-1 GONDOLA CAR WITH CANISTERS with original box.